My pastor recently used 19th century British missionary to China Hudson Taylor as the subject for a sermon. Hudson Taylor is one of my heroes, and I like the two volume biography by Dr. and Mrs. Howard Taylor the best. Here is one of my favorite Taylor stories. May the Lord raise up more men with his attitude toward money! Just then, on the 2nd of May, he was due in Hertfordshire for an important meeting. Colonel Puget, brother of the Dowager Lady Radstock, being his host and Chairman. To this new friend it seemed a peculiar arrangement to have a missionary meeting without a collection, but understanding it to be Mr. Taylor's wish the announcement had been made accordingly. When the time came, however, and the speaker proved unusually interesting. Colonel Puget realised that people would give generously if only they had the opportunity. Rising therefore at the close of the address, he said that interpreting the feelings of the audience by his own, he took it upon himself to alter the decision about the collection. Many present were moved by the condition of things Mr. Taylor had represented, and would go away burdened unless they could express practical sympathy. Contrary therefore to previous announcements, an opportunity would now be given. But at that point Mr. Taylor interposed, asking to be allowed to add a few words. It was his earnest desire, he said, that his hearers should go away burdened. Money was not the chief thing in the Lord's work, especially money easily given, under the influence of emotion. Much as he appreciated their kind intention, he would far rather have each one go home to ask the Lord very definitely what He would have them do. If it were to give of their substance, they could send a contribution to their own or any other society. But in view of the appalling facts of heathenism, it might be much more costly gifts the Lord was seeking; perhaps a son or daughter or one's own life-service. No amount of money could save a single soul. What was wanted was that men and women filled with the Holy Spirit should give themselves to the work in China and to the work of prayer at home. For the support of God-sent missionaries funds would never be lacking. "You made a great mistake, if I may say so," remarked his host at supper. " The people were really interested. We might have had a good collection." In vain Mr. Taylor explained the financial basis of the Mission and his desire to avoid even the appearance of conflicting with other societies. Colonel Puget, though sympathetic, was unconvinced. "I felt last evening that you were wrong about the collection, but now I see things differently. Lying awake in the night, as I thought of that stream of souls in China, a thousand every hour going out into the dark, I could only cry, `LORD, what wilt Thou have me to do ?' I think I have His answer." And he handed Mr. Taylor a cheque for five hundred pounds. "If there had been a collection I should have given a five-pound note," he added. "This cheque is the result of no small part of the night spent in prayer." Taylor, Howard, 1862-1946; Taylor, Howard, Mrs. Hudson Taylor and the China Inland Mission : the growth of a work of God (Kindle Locations 1235-1250). London : Morgan & Scott; Philadelphia : China Inland Mission. Tyndale recently sent me a free hardback copy of their new Chronological Life Application Study Bible for review. For someone like me who loves books in general, and the Bible specifically, this book is hard not to like. It's beautiful. Full color throughout: photographs of Bible places, paintings, parchments, charts. It's not only a book, it's a work of art. It is by far the most aesthetically pleasant Bible I have ever seen. It's heavy. If you like Bibles that feel solid (I do), this is definitely one! It's helpful. There are tons of notes, a concordance, color maps, etc. It's unique. The biggest selling point of this Bible is that it is arranged chronologically, not in the traditional canonical order. For example, Job is placed between Genesis and Exodus. The Psalms are interspersed with David's life in 1 and 2 Samuel. Samuel and Kings are interwoven with parallel passages in Chronicles. The four gospels are interwoven, making it easy to compare each gospel writer's account of each story. The epistles are inserted in the appropriate places in Acts. Having said that, there are several weaknesses in this Bible. The very fact that it is arranged chronologically becomes an irritating slowdown if you are trying to find a particular passage. Despite the extensive canonical table of contents in the beginning, it's not a Bible you would take to church or Bible study, where you want to be able to find passages fast. I think I would enjoy this Bible much more if it were arranged canonically. There are also disadvantages to blending the four gospels into one. Each gospel writer aimed to bring out specific aspects of Jesus' ministry and character. Each author's sequence and selection of stories from Jesus' life were not random, but carefully planned. This gets lost in the "combined" version. Tyndale has only released this Bible in the KJV and NLT, both of which are inferior for serious study to the ESV, HCSB, or NASB. It has no cross references. In this sense, it is not a true study Bible. While overall the commentary notes are accurate and concise, there are evidences of a bent towards evangelical liberalism. The notes on Genesis leave room for theistic evolution, and the notes on the role of women in church lean towards egalitarianism rather than complementarianism. So how would this Bible best be used? Who should buy one? A person who is seeking to absorb a lot of information about the Bible efficiently. Such a person would gain a very broad and organized education by reading through the entire Chronological Life Application Study Bible from cover to cover. It is not a Bible to keep on the shelf for occasional reference; it's a Bible to read through carefully, and then pass on to a friend. If you would like my copy, let me know! For more information, check out the video. My mother recently discovered a powerful poem by Robert Murray M'Cheyne, the Scottish pastor who accomplished more before he died at age 29 than most men do in a full lifetime. To understand the poem, you need to know that the key phrase, Jehovah Tsidkenu, is Hebrew for "The Lord Our Righteousness". It refers to how, through Jesus, God credits His people with righteousness, a righteousness they did not earn or deserve. Jehovah Tsidkenu twas nothing to me. Jehovah Tsidkenu my Saviour must be. If you'd like to try singing this poem, it can be sung to the tune Gordon, which is most famously sung to "My Jesus I Love Thee". So then, those who had raised their hand were baptized, and there were added that day about three souls. And they were occasionally devoting themselves to the pastor's sermon, and to cordial chit-chat, to a cracker and juice, and to prayers for healing and prodigal children. And everyone kept feeling a sense of boredom, and many feverish labors were being done by the pastor's hands. And all those who believed were busy, and had few things in common And they began buying more property and possessions, and rented storage space for the extras. And those who had need were aided by the government. And once a week meeting at the church building they were taking their coffee and donuts together with dissipation and distraction of heart, praising their sports teams and being unnoticed by most outsiders. And the cool band and relevant messages were occasionally adding to their number those who were being immunized against the true gospel. This parody of Acts 2:41-47 is not meant to be humorous or even sarcastic. Read it with tears, not with chuckles or smirks. How far our American churches have fallen from the glory of Pentecost (or even the glory of the Reformation). I am thankful to be in a church that this parody does not describe. But we too have a long ways to go. May the Lord purify for Himself a people for His own possession, zealous for good works. My uncle, a Vietnam Vet, sent us this video about how President Nixon threw a dinner -- still the largest dinner ever held at the White House -- for former POWs. What was touching to me was how meaningful this memory is to these men, even after forty years and Watergate. If you want to change the world, invite someone to your home for a meal. But not just anyone. And that's a far greater reward even than creating warm memories. Should Tozer Have Remained Single? When Mom was in the nursing home, I used my time commuting back and forth (and time alone cooking at home) to listen to the ChristianAudio.com recording of Lyle Dorsett's biography of Aiden W. Tozer, A Passion for God. Two quick comments on the biography before I move on to the main point of this blog post. 1. I wish the author had given a bit more description of Tozer's successes. He describes Tozer as being popular and gifted, but he does not really make you like or connect with Tozer. Tozer comes across as something of a theological nerd, an ascetic mystic, above and aloof. There must have been something likeable or beneficial about Tozer's ministry or he would not have been so popular. 2. About Tozer's weaknesses and sinful tendencies, another review of the same book does a good job of summarizing them and I will not restate them here. Tim Challies' review is also good. The question that I want to focus on is the biggest question that I was left with after this book was finished. Would Tozer have been better off remaining single? He loved to spend hours alone in prayer. He loved giving sacrificially (about half of his not-too-high income, apparently). Both of these habits did not endear him to his wife. After his death and her remarriage to a Christian widower, she told someone, "I have never been happier in my life. Aiden (Tozer) loved Jesus Christ, but Leonard Odam loves me." Tozer's reclusive tendencies also distanced him from his 7 children to some extent. (Although all of them apparently followed him in the faith as Christians.) Even with his congregations, Tozer was more prophet than pastor: he loved preaching and teaching but did not like one on one relational work such as pastoral visits. He only agreed to take his final pastorate after the church promised that all he would have to do was preach twice a week; they hired another pastor to do everything else. "But I want you to be free from concern. One who is unmarried is concerned about the things of the Lord, how he may please the Lord, but one who is married is concerned about the things of the world, how he may please his wife, and his interests are divided." Tozer seems to have failed to recognize how marriage should have changed his priorities. If he had remained single, he could have spent those long hours in prayer and given those dollars away without neglecting family responsibilities. On the other hand, his asceticism probably limited his pastoral effectiveness, and this would have happened (perhaps even more damagingly) even if he had not been married. Marriage doubtless helped shave some of the rough edges off his personality and thus made him a better pastor than he would otherwise have been. But if he was really cut out to be a prophet, perhaps he was also better off not being a pastor. I have been given the number12 of random facts about me to share.1.I am a sinner 2.I am left handed.3.I was an asst.basketball coach at indep. comm.col.in 1986 4.I enjoy listening to classical music.5.I went to a live concert of Pavarotti.thank you tippy.6.I did not experience the day of thanksgiving in 1967.Enroute to viet nam our plane took off from alaska the day before thanksgiving when we landed in japan it was the day after thanksgiving.7.My wife is my greatest living hero,she has all the qualities I admire and lack in myself.8.I performed on stage at Carnegie Hall.....french horn 9.I sincerely enjoy people but I dont like crowds and I am relationally deficient.....ask my family 10.I stuttered all throughout school and still do at times.11.I once ran an orphanage in mexico.12.I was a recreation director for 4,ooo cuban refugees single men. 1) I have lived in the Binghamton, NY area four times in my life (totaling 13 months). 2) I have been to Oklahoma City four times (totaling almost 5 months). 3) I have been in 43 of the 50 US states (but never to neighboring Nevada). 4) I've never spent a night outside the US (hoping to change that). 5) I attended Christian preschool for 2 years (and have many vivid memories of it). 6) Despite being raised by wonderful Christian parents, I did not become a Christian until I was nearly 19. 7) The hardest mental challenge I ever undertook was building an Access database when I was 20. In retrospect, it was pretty impressive. I have been to Wrightsville, PA four times (also totaling about 5 months). 9) my first computer was a used Eagle, which ran CP/M (a pre-DOS operating system). 10) I love milking goats. 11) I love Mennonite singing. 12) I love the doctrines of grace (aka the 5 points of Calvinism). 13) I once had a torturous sleeping disorder that was largely psychosomatic. Perhaps you could use this as a relationship-deepening conversation starter with your friends. Ultimately, I think we will see how God has given each person unique experiences, weaknesses, and strengths. Don't let familiarity blind you to the gifts God has put around you. Every person is a largely untapped mine. As part of my longterm goal of developing skill as a Biblical Counselor, I have been taking training from a local Biblical counseling ministry affiliated with the Association of Certified Biblical Counselors (ACBC, formerly National Association of Nouthetic Counselors). Then I learned that the Biblical Counseling Center has produced videos using real counselees (with counselee permission). They were kind enough to let me review theirs as well. I wanted to know which set of videos would be best when our church holds its own observation classes. There were definitely differences between the two sets of recordings. Here is a chart comparing some of them. If you don't mind reading on electronic devices, you can get some quality Christian eBooks for free by bookmarking http://echristianresources.com. The site is constantly updated with the latest freebies. The ESV Study Bible is known for its excellent, conservative, extensive commentary notes. This month Crossway is making available access to the notes online, for free. You have to sign up before November ends. Unfortunately the sign up process is slightly cumbersome, but hang in there, you'll get it! After Skype closed their Skypecasting feature back in 2009, I searched extensively for another tool that would offer the same sort of tool. Skypecasts were sort of like ham radio combined with talk radio, and provided an excellent platform for evangelism. My aunt recently told me about a tool called Zello that has features almost as good as the original Skypecasts. Strangely, Zello's main feature is a way to use your computer or mobile device as a simple walkie talkie. But they also have a "Channels" feature that is quite similar to Skypecast. And it's completely free for personal use. My Zello handle is 'danielofaz'. Feel free to look me up. The Insanity of God is hard to categorize. Combine the inexplicable suffering of Job, the intense action and miracles of Mark, and the simple repetitive language of 1 John and you have a start. I read it last month on Mom's Kindle, mostly late at night after coming home alone from caring for her in the nursing home, and found it oddly encouraging. It is the story of a man with character strengths and flaws meeting a God who is not "tame". Nik Ripken is a pseudonym. But his story is true, and more unsettling than any work of fiction. He and his wife went to Africa as missionaries and he wound up trying to provide basic provisions for the people of Somalia for 6 years in the 90's. The work was extremely demanding and unsafe. He was there before the UN arrived and he stayed on after they left. He witnessed all kinds of tragic situations and at the end of it all, he was unsure whether he had done any lasting good whatsoever. When funds dried up and he finally had to shut his work down, one of his sons died suddenly of a freak asthma complication. Deeply discouraged, he returned to the US with his wife and remaining two sons. Then he got the idea to travel to countries where the church has lived or is living through intense persecution, to ask them what has helped them thrive under suffering. He thought perhaps he could use this to help the Somalian church, which had been nearly exterminated. The experiences and conversations he had are enough to make any VOM worker envious. Suffice it to say that you could make compelling feature-length movies out of many chapters from this book. But oddly, the book itself is not exceptionally well-written, despite the help of a co-author. The story is told simply; sometimes with unnecessary repetition and sometimes with colorless language. But the story itself will keep you reading even when the words do not. The book lacks much interaction with Scripture; don't base your theology on it. Most interestingly, the book does not have a picture perfect ending. Dr. Ripken opens the jagged edges of his life story to you, and leaves you with the same questions and uncertainties that he still faces. You will question some of his decisions, and be inspired by others. I have read a lot of books about the persecuted church, and this is now my fifth-most favorite book in that category. (The top four are, in order: Tortured for Christ, God's Smuggler, In God's Underground, and Faith That Endures.) If you have a Kindle and want to read it, I can loan you my copy for free. Please check out the video trailer below. "Insanity of God" from imb connecting on Vimeo. Thank you (and _____) for your encouraging emails. It’s amazing to me that in the middle of the busyness of your work in _____ you find time to pray for us, much less write notes! I don’t say all this as “a word from the Lord” but just something that came to mind while I was thanking Him for you. I've received a fair number of books for free in exchange for an unbiased review. Most of them were interesting. But this one is compelling. I could recommend you buy most of the others I read. But this one, I might actually buy myself a few more copies to give to friends. Pastor and professor David Murray takes a complex and controversial area of theology -- interpreting the Old Testament correctly in the light of the fuller revelation of the New Testament -- and explains it in language that is both simple and beautiful. Jesus on Every Page is wonderful in almost every way. It's well organized: you could easily use its chapters as outlines for a preaching series or Sunday school class. It's personal: Murray shares his own journey in appreciating the Old Testament. And it's condensed: he doesn't flesh out every point in minute detail. It's the kind of book that makes you think deeply rather than doing all the thinking for you. After His resurrection, Jesus told His disciples, "These are my words that I spoke to you while I was still with you—that everything written about me in the law of Moses, the prophets, and the psalms must be fulfilled." Then he opened their minds to understand the scriptures, and he said to them, "Thus it is written, that the Messiah is to suffer and to rise from the dead on the third day, and that repentance and forgiveness of sins is to be proclaimed in his name to all nations, beginning from Jerusalem." (Luke 24:44-47, NRSV) Jesus on Every Page shows how what Jesus said is true of every era and genre of Old Testament writing: the creation, the law of Moses, the prophets, the historical narratives, the Psalms and Proverbs, even the Song of Solomon. They all point forward to Jesus, more clearly and beautifully than I had ever noticed. When Jesus showed two disciples on the road to Emmaus how the Old Testament talked about Him, they said afterwards, "Did not our hearts burn within us?" I felt like that while reading this book. It's that great. The only negative I see in this book: David Murray is clearly a believer in covenant theology rather than dispensationalism. As such, while we both see tremendous foreshadowing of Jesus in the Old Testament, he sees greater continuity between the old and new covenants than I do. His treatment of passages like 2 Corinthians 3 seemed forced. Nevertheless, I heartily recommend this work as a great source of spiritual nourishment for your soul which will cause you to understand and delight in Jesus more as you see Him throughout the Old Testament. 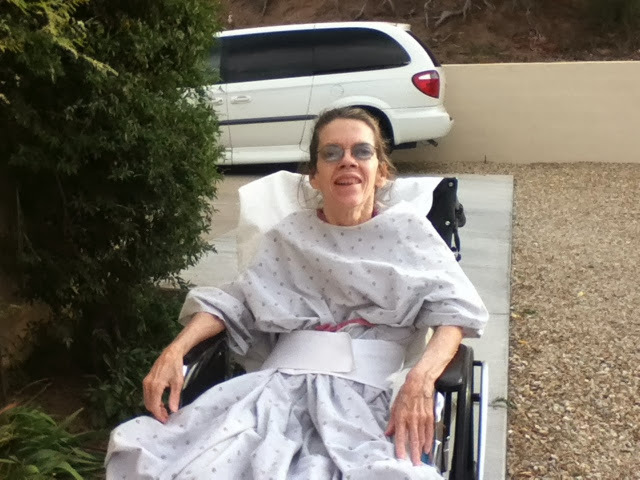 Mom came home from Kachina Point Rehab Facility on November 1, exactly a month after she was first put in the hospital. Here's a picture of her getting a little sun this afternoon. She has an appointment Tuesday to get an X-ray and see the bone doctor. Behind her you can see the wheelchair-accessible van we purchased. We will miss many of the people we met at Kachina Point, both staff and residents. The Lord gave us many wonderful opportunities to talk about Him while we were there. God has been faithful and good to us, in answering the prayers of his people for mom and for dad and me too. The future is uncertain for Mom, but His promises aren't. English speakers today have the blessing -- and responsibility -- of access to more Bibles and Bible tools than any other language or time in history. Men and women throughout history have died horrible deaths so their people could read God's Word in their own language, a privilege we take for granted today. Recently Tyndale gave me a free copy of a new Bible they've produced, for my review. I wasn't required to give it a positive review, but I see great potential in this "Wayfinding Bible". It is specifically good for people who want to get a good overall grasp of the Bible quickly. Think of a serious seeker or a new believer or someone who has dabbled in the Bible for years but now realizes they need to go all-out. The basic idea is that this Bible provides three reading tracks to take you through the most essential portions of the Bible: flyover, direct, and scenic. The tracks are easy to follow, just look for the colored arrows. There are also helpful section and book introductions that orient readers to where this part fits into the overall storyline of the Bible and how it points to Jesus. This Bible uses the New Living Translation (again, aimed more for introductory readers than for seasoned Bible students). It has a nice weighty feel in your hand and the pages stay open nicely. All of the pages are full color; there are even color photographs, maps, and infographics sprinkled liberally throughout the text. There is not much room for writing marginal notes, and it does not include cross references. If you would like my copy, send me a note and I might send it to you for free! Also, check out the video below for more information. Tim Maxwell has been in combat. This medically-retired Marine Lt. Col. has the medals / post traumatic stress / traumatic brain injury to prove he's the 'real deal'. Though his brain injury and physical limitations are very significant - his passion and tenacity have driven him to help many, many 'wounded warriors'. Below (and unaltered) are his thoughts. As you consider what he has to share - especially in light of all the military sexual-abuse and female-casuality reports currently being reported - what are your thoughts? women and men only play men? Can't they see how dumb this is? win this game look around, amazed that they are still alive. If combat was a professional sport, a violent sport, like this, would America order every team to accept women? A Short Life of Jonathan Edwards is available for free download this month. I have been listening to it and it is surprisingly helpful for putting modern church problems in context. Grab it while you can, even if you don't have time to listen to it right away. • are a member of a recognized religious sect with religious objections to health insurance If you don't qualify for these situations, you can apply for an exemption asking not to pay a fee. You do this in the Marketplace. What kinds of health insurance don't qualify as coverage? Dear Friends, Happy New Year. As most of you know, Obama won the election which means “Obama Care” will stand starting 2014. This means Americans are required to have health care by 2014. For those of us who are not independently wealthy, do not fall into medicare/Medicaid, or have free or employer provided health care, the step to comply with the law will be costly. As a result of the changing laws, and a run in personally with 2 medical issues in 2012, I’ve done some research to find alternatives or a health insurance company that meets my needs. I’m writing this letter to give you all the health care information I discovered that may help with some decisions that need to be made over the next year. I’ll start with the summary and for those who want the details, keep reading. I’ve chosen to go with a Christian health care sharing plan for multiple reasons (read the details below – it’s good). There are 3 Christian sharing plans that were written into the Obama care law eligible to meet the requirement for individuals to have health care. Out of the 3 organizations, I found Samaritan Ministries to be the best. After going to the emergency room last year with a pain that I thought was appendicitis, and then getting an inner ear problem that left me dependent on others for about a month, I thought it was time to look into health insurance. The more I looked the more disappointed I got. However, a friend told me about Samaritan Ministries (SM). After asking an onslaught of questions, I went to the Internet to do more research. I’ll share a little about how it works (since you can go to SamaritanMinistries.org for more info) and then the main questions that were answered for me when comparing SM to regular insurance. SM shares the cost of health care across its members. Depending on whether you are an individual or a family, your monthly share amount goes to a member who has a “publishable” health need. Your membership fee monthly does not change unless the board votes for this. The specifics for the board to vote are clearly stated on their website. Not only do you help another believer in need, you have the opportunity to pray and write a note of encouragement. This means if you have a “publishable” health care need, you too will receive checks from many people to cover the need, along with notes of encouragement and prayer. KEYS to SM for me. By sending your check directly to the person in need, you by pass the laws that say this is an insurance company. SM does NOT manage the health care funds. You are assured some one in the company is NOT absconding with the funds either. Because SM is NOT an insurance company, they are NOT required to cover some ethically questionable procedures and medicines. It’s Christian based and therefore applies Biblical principles to caring and helping others, especially with prayer. To be a member is affordable for many who otherwise could NOT afford health insurance. Price comparison per month with health insurance seemed the same or better with SM. You pick any hospital or doctor you want, covers emergencies overseas or anywhere in the USA. You are a “cash pay” which tends to bring bills lower, and for larger amounts, SM has a group that negotiates to bring the price down. It meets the Obama Care requirement to have health care. Had a tremendous reputation after reading multiple user reviews from various websites. I searched for a negative review and could NOT find one on SM. Yet I did find some issues with at least one other health care sharing organization. They have 2 programs, one up to $250,000 and a second additional program up to 1 million. The website is VERY CLEAR and does NOT seem to have hidden things like how member fees increase, etc. So I felt like I wasn’t wondering when and if an insurance company would raise my premiums. How many times have I heard people saying “my premiums are so expensive” and “my deductible are so high”? People DON’T use their health insurance because they fear increased premiums. What’s the point then? This is NOT an insurance company and is NOT regulated by certain laws. Pray, as it takes faith to know this is what God wants you to do. Not all needs are publishable (such as dental) but the do put the “unpublishable” needs sometimes in the newsletter for those who wish to give extra. Do your research on medicine as it may or may not be covered with SM. Preventive care is NOT covered. Choose doctor/hospital depending on coverage. Hope this helps you. Remember to contact me if you decide to go with SM. All choices made regarding your health care must be made based on your own personal circumstances. Please do your due diligence and research before deciding as fees, rules, and many other factors change from system to system and person to person. I will take NO responsibility for any choices made regarding health care decisions.